Spider veins are small, thin veins shaped like spiky tree branches or spider webs. Most often, they are red or blue in color. These veins can occur on the legs or the face and may cover a small or large area of your skin. People who have spider veins may feel self-conscious about their appearance and desire to have them removed. Sclerotherapy is a highly effective treatment for spider veins and collapses the veins so that they don’t show through the skin. Spider veins are often caused by the backup of blood. Healthy, strong veins carry the blood in your body through one-way paths. These paths are separated by valves that serve to prevent the blood from going in the wrong direction. However, sometimes these valves can weaken, causing the blood to back up. This leads to the appearance of spider veins. Other causes of spider veins include injuries, hormonal changes, and too much sun exposure. Risk factors for developing spider veins include aging, medical problems, a medical history of weak vein valves, family history of vein problems, obesity, pregnancy, hormonal changes, sun exposure, and standing or sitting for long periods of time. While they are not typically dangerous, spider veins can cause itching or burning and are often perceived as unattractive. Here at Skin Physicians & Surgeons, sclerotherapy is the preferred method for treating spider veins, especially those on the legs. This simple procedure entails injecting a liquid chemical irritant or detergent into the spider vein, causing it to collapse. The injections are nearly painless and will ensure that the vein no longer fills with blood. Patients wear compression pantyhose for the week after treatment to help keep the vein compressed. The vein fades away within a few weeks, eliminating its unsightly appearance. 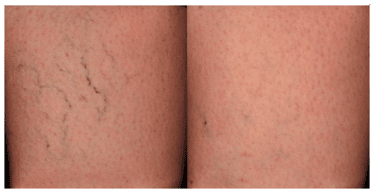 In more serious cases, multiple treatment sessions may be needed to eradicate spider veins. Sclerotherapy has a high success rate; however, as there is no cure for weak vein valves, spider veins can reform. Wearing compression support stockings during the day and following your doctor’s recommendations can help to prevent them from forming. For more information about leg vein removal and treatment of spider veins or to schedule your sclerotherapy procedure, call us at 909-981-8929 or fill out our online contact form. This entry was posted on Tuesday, November 17th, 2015 at 11:44 am	and is filed under Cosmetic Procedures, Sclerotherapy, Spider Veins. You can follow any responses to this entry through the RSS 2.0 feed. Both comments and pings are currently closed.